ALFA Nationals Awards Announced for the MEGA SHOW. You MUST be a paid member of ALFA no later than the entry deadline date (Absolutely NO exceptions, no postmarks accepted) to be eligible to compete for ALFA Awards. 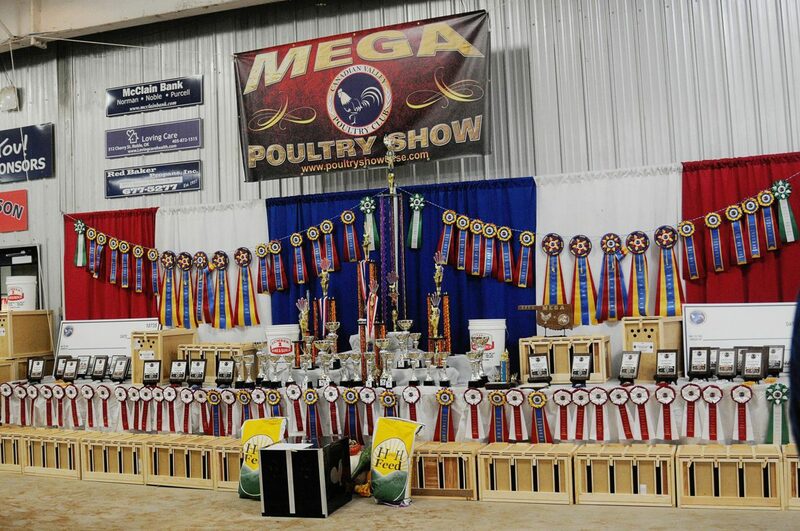 These awards are for current ALFA members only and will be paid in addition to any other premiums won in the MEGA Show on Nov. 3rd in Norman, OK.
For more ALFA information please go to our web site at www.poultryshowcase.com and read ALL the information we have posted. This ALFA Show was judged by the Official ALFA Show Committee comprised of between 3-5 independent judges, long time experienced breeders and other qualified individuals who was be selected at the show and who remained anonymous until the judging to insure the integrity of the show. ALFA Basic Rules are located at the bottom of this page. Since this is a new concept we will be making changes as we progress. 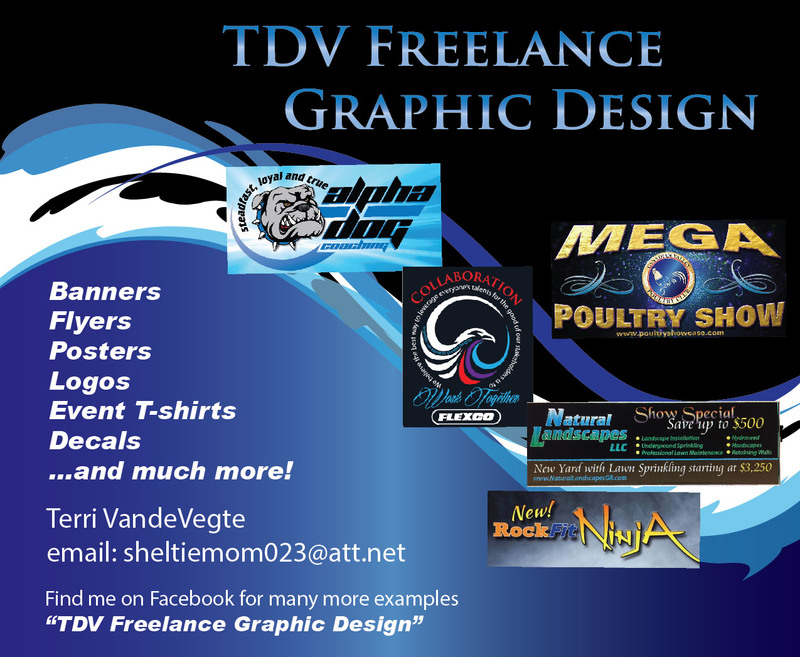 We are running 2 beta test shows before the MEGA Nationals to test our system and make improvements. 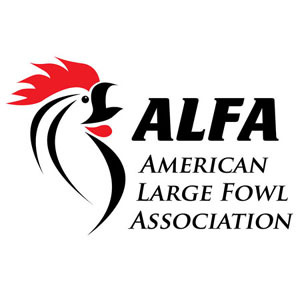 ALFA© is the acronym for “American Large Fowl Association.” ALFA©is a new organization formed for the advancement, growth, increased knowledge and numbers of all Large Poultry Fowl, Standard and Non-Standard. All non-standard LF must be in the final stages of acceptance into the APA Standard which means they must have a written and approved “Standard Description” of their new variety/breed. 50% of ALFA© membership fees in a district will be given back to each District for their Annual District Show (20% withheld for awards & administrative costs and the remaining 30% will go into the Jackpot Fund for the Annual National Show) are awarded back to our members in the form of awards at our National Show which will be held each November in Norman, OK. Norman which is centrally located in the center of the country at the crossroads of I-40 and I-35. ALFA© Awards are completely separate and apart of all other MEGA Show Awards and the ALFA© Champions must be owned by an ALFA©Member. ALFA© winners must have joined a minimum of 30 days before the MEGA SHOW. This rule will be strictly enforced as our membership books will close for 30 days before the show and will remain closed until after the MEGA SHOW. ALFA© is NOT in competition with any other breed club or breed organization. On the contrary we are being designed solely to promote and build the numbers of ALL large fowl. Our goal is simply to be an all inclusive Large Fowl Association (club) attempting to increase the popularity and awareness of all large fowl breeds. We invite ALL breed clubs to join us in ALFA©. In addition ALFA© is an Associate Club Member of the APA. Our first “ALFA©”Nationals will offer a minimum of $1,000.00 to the Top 5-20 ALFA© Birds in the MEGA SHOW depending on numbers. ALFA© Awards are “In Addition To” any other show awards and can only be won by current ALFA© Members. These numbers could and should go up dramatically depending on ALFA© memberships sold. For example, if ALFA© Membership is 100 by the MEGA Show next November we could award $1,050.00 to the top 5-20 birds. If 500 memberships are sold the total amount awarded to the top 25 birds could be $5,250.00. If our membership were to go over 1,000, the top 40-50 birds could divide close to $10,500.00. Roughly 60%-70% of all ALFA© membership fees will be awarded. All ALFA© bird entries must also be entered in the regular show. We plan to expand our ALFA© program to include District Shows across the country in the next few years with each District Chairman receiving a portion of the membership fees sold in their District for the show of his/her choosing. These awards MUST be given in addition to any and all of the host show’s normal premiums. How Are ALFA Awards Determined? ALFA will send your District Director 50% of the card money for cards sold in your District to be awarded in your District Show(s). 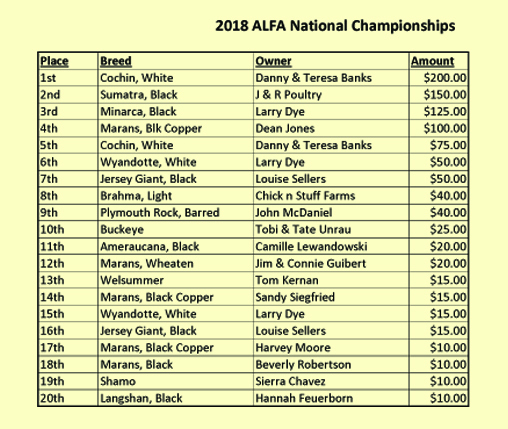 Since some States are so large and have an abundance of Large Fowl this could be a good sum so the District Director’s are in full control over which show(s) they add the ALFA Show to and how much is given to each show. If a District does not host a District Show in any year their member money (50% of the dues in that district) will be applied to the National Awards Fund. We need shows which will accommodate ALFA. It is suggested that a committee made up of 1 judge and 2 major breeders do the ALFA selections and awards. They make the final ALFA placings and these awards must be done in addition to the regular show’s awards. The trade off for the club (show) is that ALFA should increase their Large Fowl turnout. ALFA will be doing an ALFA video this weekend and will explain it completely and have it on our web site. We simply need ALFA members now and we are off and running. We suggest all ALFA shows be done in the Fall each year. The breakdown for a $15.00 ALFA Card is this- 50% to the State where the ALFA member resides (District Director is in full control of this money), 30% to the National Show in November each year and 20% for the administration of ALFA. Our PayPal fee’s are 3.5% of each card sold which leaves ALFA with 16.5% for administration fees (trophies at Nationals, etc.) An ALFA Video will be posted soon outlining the entire process. “ALFA©” will be an excellent opportunity for non-standard Large Fowl which are in their final stages of being accepted into the APA Standard to actually show and win while they are trying to build their numbers for acceptance in the APA Standard because they would be eligible for ALFA© awards and could go “All The Way” in ALFA©. All non-standard breeds and varieties must be in their final stages of being accepted and provide to ALFA© a copy of their Breed/Variety description so they can be judged by their accepted “standard”. ALFA© will be an excellent show to host APA qualifying meets for new breeds and varieties. Join “ALFA©” Now! *Large Fowl ONLY may compete for ALFA Awards. ALFA members ONLY. Any APA recognized Class, Breed and/or Variety shall be eligible to compete for ALFA Awards. American Game Large Fowl are eligible for ALFA competition and awards. Any Breed or Variety which has submitted a “standard” to the APA and is requesting inclusion into the APA Standard shall be eligible for ALFA awards. ALFA competition begins with the birds which are entered in the regular show. Placings from the base show will be used in picking the top finalists for ALFA Awards. Final numbers and amounts of ALFA awards at each show will be determined by the membership numbers 30 days before the show or by entry deadline date. Absolutely no one will be allowed to compete in any ALFA event if their membership isn’t paid by entry deadline date of the show in question. Membership can be obtained at anytime during the year but only those members who are current at the show’s deadline date may be eligible to compete for that particular show. ALFA membership is good from Jan. 1st through Dec. 31st each year and ALFA members can compete at any and all ALPA shows during that year as long as they meet the deadline rules for each show. It is estimated that 70% of all ALFA Membership Fee’s will be awarded at the ALFA Nationals each November. Amounts of premiums will be based entirely on the number of ALFA memberships are sold during the year less any special events ALFA may sponsor. If a District does not host a District Show in any year their member money (50% of the dues in that district) will be applied to the National Awards Fund. All ALFA member’s birds will receive a sticker for their coop tags at check-in indicating the breeders birds are entered by an ALFA member. All ALFA Finalists will be placed on the ALFA Champion Row. If any ALFA bird is also selected as a Class Champion for the regular show they will remain on the regular show’s Champion Row until the regular show judging is complete. At that time they shall be moved to the ALFA Champion Row for Final ALFA judging by the committee. ALFA Finals will be judged by committee. The committee should consist of 1-2 APA Judges and 2-3 experienced and seasoned Breeders of Large Fowl. No Member of this ALFA Judging Committee may have any birds entered in a particular ALFA event where they are on the Judging Committee. The top ten winning birds will be determined by the final votes cast by this committee. All other lower placings will be determined by the ALFA committee. In Larger ALFA Shows the finals may consist of up to the Top 25-40 ALFA birds. The Top Ten should always be moved to the ALFA Champion Row for final judging. Placings of 11th and lower will be determined by the ALFA Committee or a portion of this committee. These rules may be modified and/or amended during the year as the organization grows, learns and advances.